A large-scale aquatint and etching on copper plate; engraved by William Simmons after the painting by Michael Hayes and published in 1854. The Corinthian Cup race takes place at the Punchestown Racecourse in County Kildare, Ireland. It is considered by many to be the finest National Hunt race course in the world and people flock from far and wide to attend the meeting. The people of Kildare treat the day as a holiday so there was in the 1850s and still is today, a great sense of celebration, jubilation and, most significantly, inebriation! 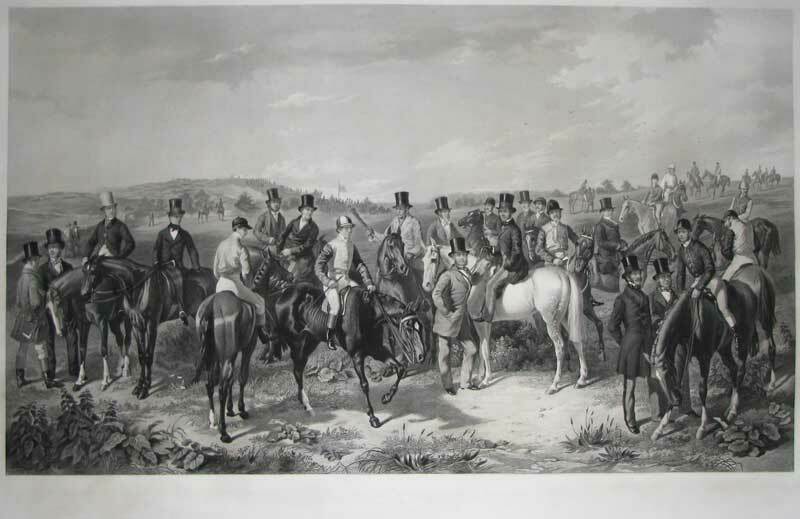 This image shows the line-up of jockeys and horses for the 1854 race. William Simmons (1811-1882) was a very accomplished mezzotint, line and mixed method engraver of various subjects after his contemporaries. He lived and worked in London and as a result of his versatility and talent he became immensely successful as artists queued up to get him to reproduce their work. This monumental image displays the full breadth of his abilities to great effect.